Following the Charleston, South Carolina, massacre that left nine people dead in a historically black church June 17, debates sparked about the continued use of the Confederate flag at the South Carolina capital and in many other southern states. Another — more overtly — racially-charged symbol is still alive and well across the U.S. though. A few southern California neighborhoods have reported white supremacist propaganda recently, and one neighborhood in Whittier, in Los Angeles County, awoke to Ku Klux Klan fliers in their front yards Sunday. The violently racist group may have seemed a thing of the past, but it still has a lot of participants. So, exactly how many members does the KKK still have? Whittier residents found plastic bags containing KKK propaganda weighed down by Tootsie Rolls and small rocks on their lawns Sunday morning (because nothing goes with white supremacist fliers like candy). The police said the fliers did not contain threats, but did mention a phone number that, when called, played a message referencing the South Carolina shooting. A week before, about 100 KKK fliers, candy included, were distributed in Fullerton, California, and in January, a Santa Ana neighborhood received similar propaganda. It's not just in California either — two different fliers were distributed throughout Topeka, Kansas, earlier this month. 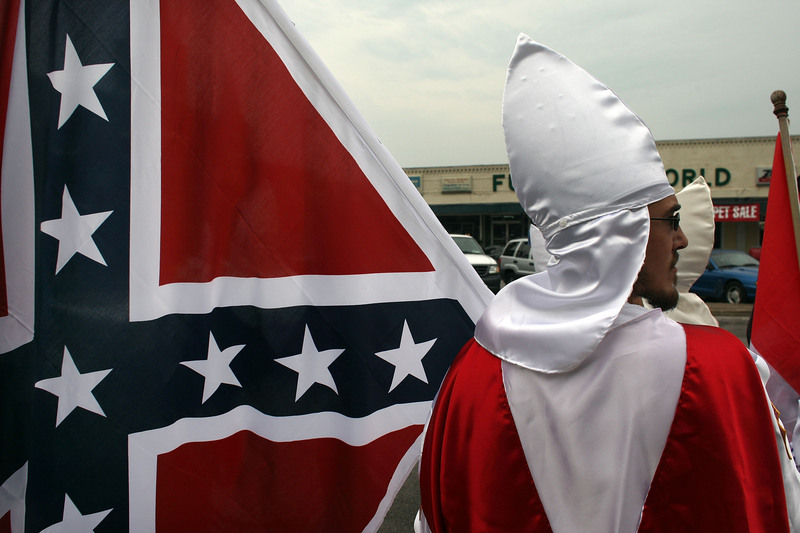 The Southern Poverty Law Center estimates that the KKK currently has between 5,000 and 8,000 members nationwide among different organizations that use the Klan name. Yes, it's a far cry from the millions of men and women who belonged to the Klan in earlier eras, but the fact that it's still operating at all says a lot about the state of America's racial divisions. The group is widespread, too — with affiliated organizations in 25 states. According to the Southern Poverty Law Center, Tennessee has the most by far, with a total of 12 functioning groups. Many states, including Colorado, Maine, and Missouri, only have one current group, but that's still one too many. The latest strategy of some KKK groups to rebrand themselves has been to claim that they're not racist, they're just fighting for "civil rights for whites" (otherwise known as every law on the books). In January, an Arkansas billboard for the KKK's White Pride Radio station was seen on the side of road, saying: "It's not racist to love your people." No amount of rebranding can wipe away the decades of racially motivated attacks and terror initiated by the KKK.